Gandhi left many powerful legacies that included a focused life of simplicity. Mohandas Gandhi was both a political and spiritual leader. The father of the Indian nation, he left us with a wonderful example of living life fully with simplicity and minimalism. Born into wealth and privilege, he studied law in England, but when he died, he had fewer than ten possessions – by choice. In our lives, we are typically busy collecting, attending to, and trying to keep our many possessions, but is life about these possessions? We also may have a plethora of activities and thus may often not be able to really focus upon or enjoy any of them.I am no different, but increasingly I am instead more drawn to relationships. Likewise, I am learning to shred away some possession and to also say “no,” and reset my priorities. George Carlin used to talk about our “stuff” and how we would spend all our time and energy just preoccupied with our stuff. Here are five simple, yet potent life lessons from Gandhi’s legacy that may allow us to move from success to fulfillment. Lead a simple, stress-free life. Exercise, meditate, and reflect daily. Do your own tasks simple tasks. Accumulate little. If you are like Gandhi, you might have only clothes, shoes, cooking and eating utensils, a watch, and glasses. He would auction off or give away any gifts he would receive. Dress simply. Gandhi wore simple clothing for modesty and comfort and shaved his head. Eat simple food. 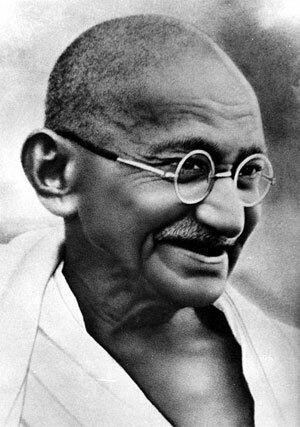 Gandhi was a vegetarian who ate modest locally grown portions from a small bowl. Let your life be your message. Gandhi let his life do his talking yet set an example that has influenced hundreds of millions even to this day. Whether you appreciate it or not, others are watching you as well. Is the way you are living your life the message you want to express? I’m not suggesting that everyone go out and copy Gandhi’s example to a tee. Heaven knows that the world economies would collapse if we did, particularly our consumer-oriented western one. Besides if you are like me, you enjoy our many modern conveniences. I am suggesting, however, that we examine each of the above lessons and perhaps in some small way see how we might apply them to our lives. These five lessons may give us the pause to create better balance and help us pare back our many possessions and needless attention-grabbing activities. With less distractions, each of us is better able to focus, and consistent focus toward others can lead us beyond success to significance – and create a more inspiring legacy.